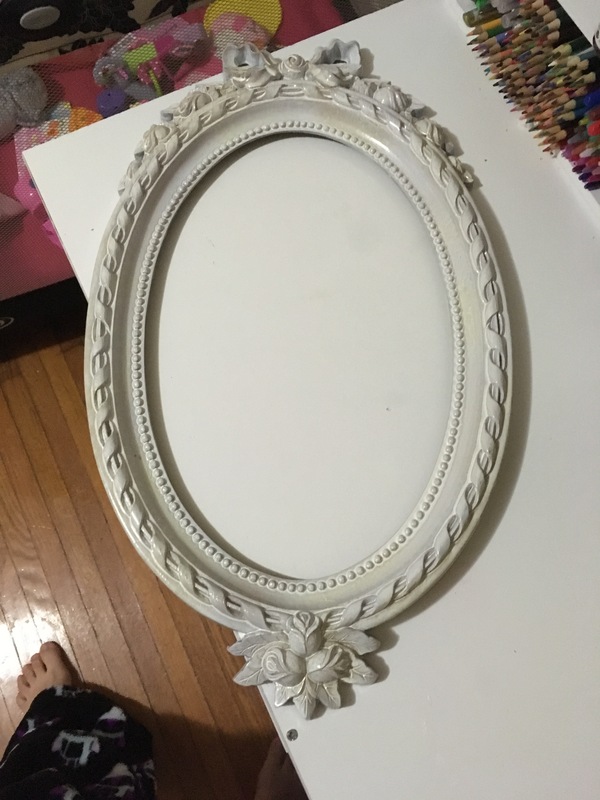 up-cycling | ... And Show Your Work! I successfully completed an upcycle project! I am kind of a hoarder. No, I don’t keep gross stuff like old food and trash. My house is reasonably neat. But I have a hard time throwing away (or giving away) certain things. Old t-shirts, for one. Glass and plastic storage containers, for another. So I have a little cube storage bin in my craft room for “upcycle” projects. Everything has to fit into the cube or it has to go away. Periodically I go through it, but not nearly often enough. Yesterday, I went through it. I had been hoping to start a t-shirt quilt yesterday, because about half of the bin is filled with t-shirts. But, surprisingly, for as tiny as I am, my t-shirts take up a lot of room. After sorting through, I only found 10 t-shirts – not enough to start my quilt. I did cut them down to quiltable size though – and discovered that no matter how I work with it, there is one that is just too big to be a quilt square. I think I’m going to turn it into a pillow, instead. 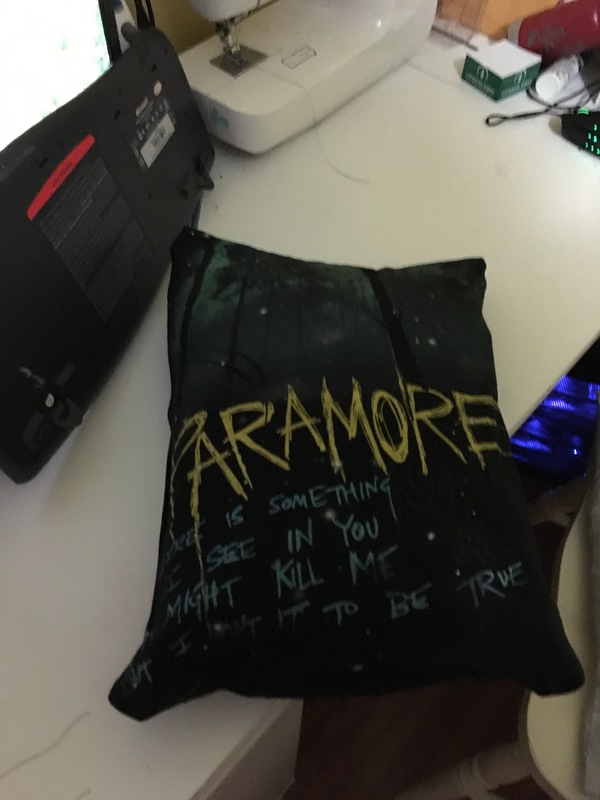 It’s a band t-shirt and I know someone who is a much bigger fan than I am who might like it. Cutting them down did make them take up a lot less room in my hoarder bin, so that was nice. But it did not really solve the problem of me getting a craft activity done yesterday. So, I kept looking. I found an old plastic cornstarch container. I had some spray paint. 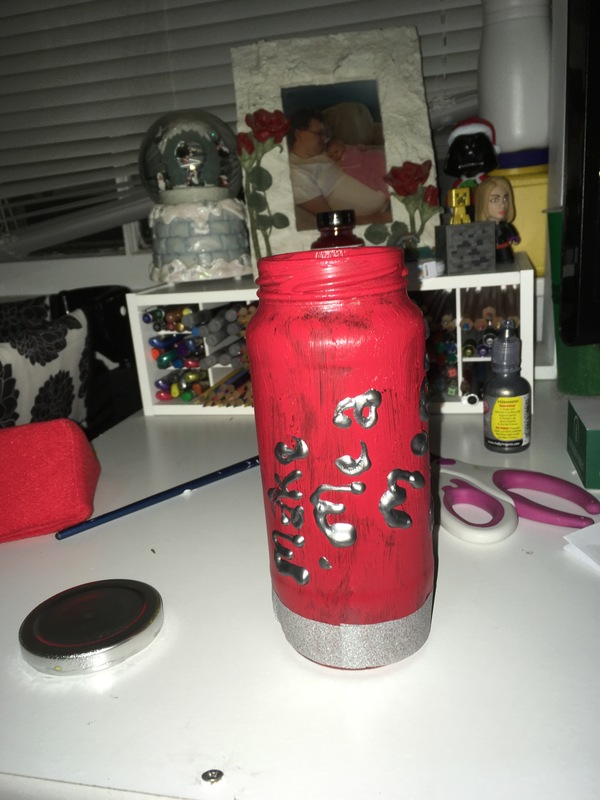 So, I spray painted it. But the spray paint didn’t dry right, so I gave up and did yesterday’s project. Today, though, the clouds parted for a little while, and it was nice and warm outside, so I decided to take another crack at it. 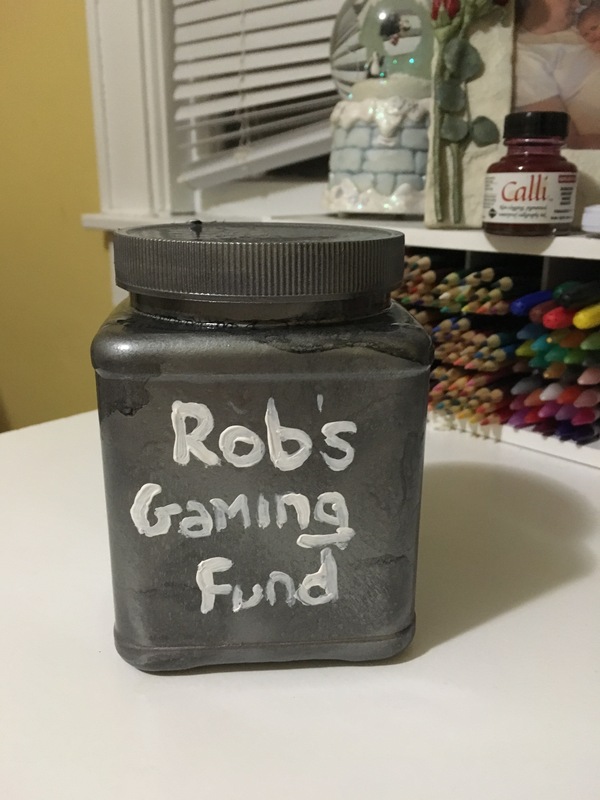 The spray paint still didn’t dry quite right (it was this forged hammered paint and I think the humidity/original coat not drying correctly messed with it) but I showed it to my husband and he liked it, so I painted “Rob’s Gaming Fund” on it, and voila! 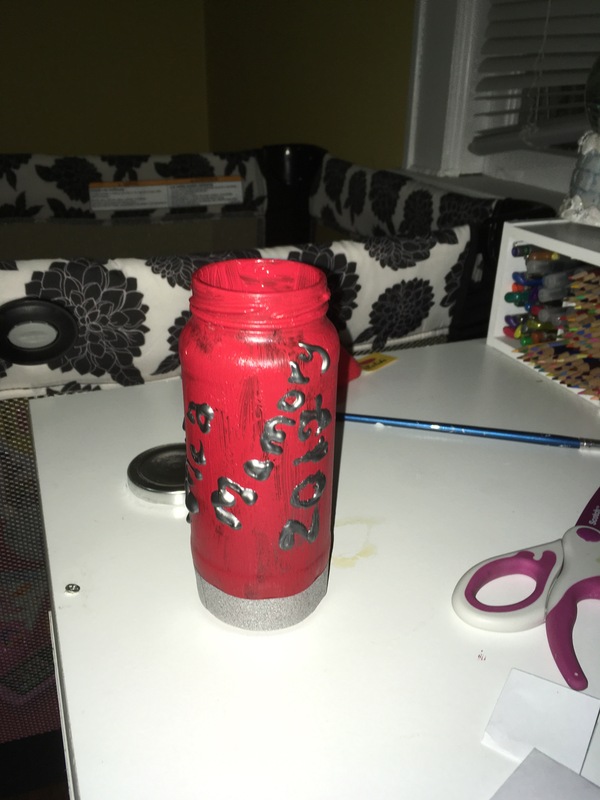 A finished craft project! Today, after a false start with another project, I decided to use the daylight and get this spray paint job out of the way instead. I intentionally let a little bit of the original paint show through- I think it gives it an antique look. It is going to hang around another project I made that is in the nursery right now, but it is still drying and Baby Girl is asleep, so hanging will have to wait. This year I have exactly three weeks between New Year’s Day and the day I have to be a Real Adult again (a conference in Atlanta, and you bet your sweet bippy I’ll be using my Conference Trip Planner!). That has inspired me to try something: 21 Days of Creativity, three weeks of projects. Unlike when I have tried this in the past, I don’t want to work a set amount of time each day – I want to have a finished product each day. I could work on some of my stuff for weeks and not have a finished product- that doesn’t seem motivating to me. So I have planned 21 mostly small things to do. And here is the first! I painted this year’s empty molasses jar (the contents of which was split between gingerbread men and a molasses brown sugar glaze for the ham) to be a memory jar, stealing the idea from approximately a million people on the internet. I already have two memories written down for today. I’ll see you tomorrow, with another project write-up.